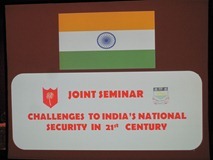 A one day National Seminar on “Challenges to India’s National Security in 21st Century” was conducted on 26 March 2012 by Area HQ ATNK & K (Andhra Pradesh, Tamil Nadu, Karnataka and Kerala) of Southern Command of Indian Army and Department of Defence and Strategic Studies, University of Madras. 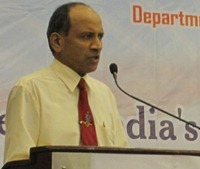 Welcome address by Dr. Utham Kumar Jamadhagni, Department of Defence and Strategic Studies, University of Madras. Keynote address by Lt. Gen. (Retd) Prakash Menon PVSM, AVSM, VSM, Ph.D; Military Advisor to National Security Council Secretariat; Govt. of India. 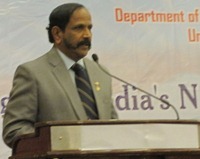 Special address by Shri R. Nataraj I.P.S; Chairman – Tamil Nadu Public Service Commission. 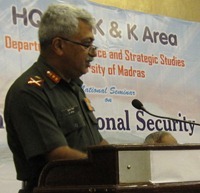 Presided by Lt. Gen. Subroto Mitra SM, VSM; GOC – ATNK & K Area. 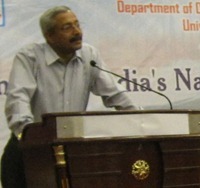 Prof. Gopalji Malviya, Head – Department of Defence and Strategic Studies, University of Madras. 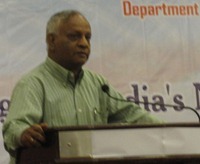 Lt. Gen (Retd) S. Pattabhiraman PVSM, AVSM, SM, VSM; Former Vice-Chief of Army Staff. 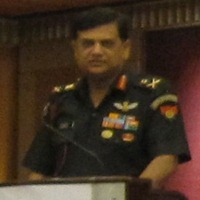 Lt. Gen Anjan Mukherjee AVSM; Director – General, Financial Planning Army HQ, New Delhi. 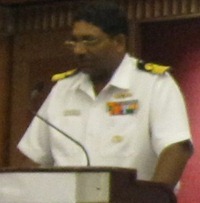 ‘Challenges to National Maritime Security in 21st Century’ by Commodore Amar K. Mahadevan VSM; Naval Officer – in – Charge, Tamil Nadu. ‘Coastal Security – CG Perspective’ by Deputy Inspector General B.K. 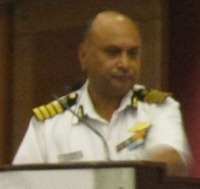 Loshali, Coast Guard Regional Head Quarters (East). Closing remarks by Dr. Utham Kumar Jamadhagni, Department of Defence and Strategic Studies, University of Madras. Present discussions on national security may hold good for a decade or two; looking beyond may be difficult and may not be meaningful. Geography and History of our neighbouring countries decide the type of threat. ‘Non – Alignment 2.0: A Foreign and Strategic Policy for India in the Twenty-first Century’ published on 30 January 2012 deals in detail about the national security challenges; India believes in partnership with other countries depending on the context: India may partner with China on climate issue, world trade; India may partner with U.S on nuclear proliferation and so on. As India is a responsible nuclear power, conventional threats are minimal. But non-conventional threats either indirectly or directly may come up. Political and Societal threats affecting democratic and secular fabric of the nation. Modernisation of Military: Though modernisation of Indian Navy, Indian Air Force, Indian Coast Guard are progressing well, modernisation of Indian Army is not upto the mark. China: India and China are old civilizations; border disputes are being sorted out by bilateral talks. Pakistan is no more a threat as they have enough internal issues to be sorted out; but will continue its ‘all weather friendship’ with China. Sri Lanka: can not forget its geographical and cultural bond with India; though it has fought terrorism successfully, it has not done enough to live in peace; India’s vote in support of the resolution against Sri Lanka at the UNHRC on 22 March 2012 is value based. Bangladesh: can not ignore its geographical and cultural bond with India. Let us find our own Indian solutions to our problems instead of depending on solutions from western or other nations. Human capital has to be developed. Federal Structure: The practice of compromising Rashtra Dharma for Coalition Dharma, may become a threat to national security in the long run. Terrorism is a war by other means. Terrorist thinks globally and acts locally. Home grown terrorism is increasing and is mostly carried out by ‘lone wolf’. The target of attack is closer to terrorist’s place of residence mostly within 30 kms of radius. Effective day to day street policing can definitely postpone a terrorist act if not prevent it. States need effective, adequate police force as State governments are responsible to maintain public order. Freedom can not be compromised in the name of security. Internal Security can only be successful by addressing core elements of Human Security: Economic Security, Food Security, Health Security, Environmental Security, Personal Security, Community security, Political Security. LWE – Left Wing Extremism. Local disturbances due to social inequalities. Crimes to be checked: Street crime, neighbourhood crime, offset crime. Setting up Special Task Force for specific issues. Setting up Coastal Security Group as India is having a vast coastline of around 7500 kms. Effectively monitoring migrant population with existing laws. Intelligence: Various intelligence agencies of Centre and States have to work together to evolve actionable intelligence at the right time. Providing adequate resources to police. Around 4 million fishermen live in 3322 coastal villages/towns along the coast. Apprehended fishing boats by security agencies for violating International Maritime Boundary Line (IMBL) can be used for espionage and subversive activities in neighbouring countries. It is difficult to identify intruders coming in fishing boats due to their physical, cultural, linguistic similarity with neighbouring countries. 73 marine police stations are being set up in the first phase along the coastline. Mapping of coastal areas by marking marine police stations, check posts, fishing villages has been undertaken by Tamil Nadu, Kerala states and Lakshadweep administration; similar exercise is being done by other coastal states also. Ministry of Home Affairs, Ministry of Petroleum & Natural Gas, Ministry of Shipping, Ministry of Earth Sciences, Ministry of Agriculture, Ministry of Defence. 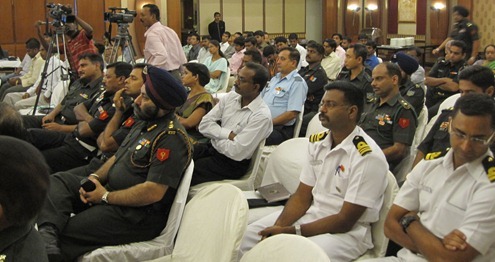 Indian Navy, Indian Coast Guard, Customs, Marine Police. Is seen as a major stabilising force in the Indian Ocean’s Energy Supply Route not just for India alone but for the world at large. Keeps vigil on narcotic traffic routes, illegal arms movement, human trafficking, terrorism, piracy in Indian Ocean. Is always prompt to provide relief during natural disasters like cyclone, tsunami in the region. Keeps vigil on vast coastline of around 7500 kms and around 2.01 million sq kms of Exclusive Economic Zone. Keeps vigil on violations in IMBL by fishermen. Awareness on coastal security is being created in fishermen to gather human intelligence on coastal security. 46 radar stations are being set up in light houses along the coastline. 11 Remote Operating Stations (ROS), 3 Regional Operating Centres (ROC) are being set up with a Control Centre at Coast Guard Head Quarters. Finally it is important to mention para 277 of ‘Non – Alignment 2.0: A Foreign and Strategic Policy for India in the Twenty-first Century’ on national security. Threats to national security can no longer be addressed by simply having more armed forces and buying more military hardware. National security is deeply and intricately linked to the knowledge society and the knowledge economy, which at its core is multidisciplinary and highly collaborative. An ecosystem approach will encourage collaboration within government, and make it possible to leverage the assets in the rest of the economy for achieving progress in education, research, technology, cyber-security, and defence production.